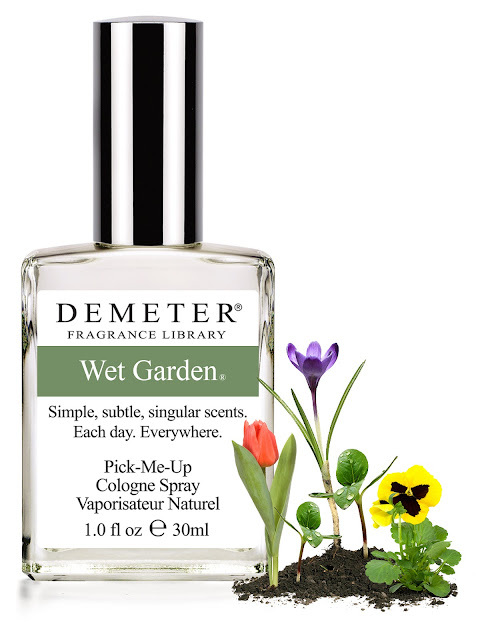 Today I want to represent you other two realistic scents from DEMETER Fragrance Library - WET GARDEN and THUNDERSTORM. "Not perhaps the original Wet Garden, but . . . very popular! Just as all Dirt is not created equal, so too, all Wet Gardens are not created equal. In the case of our Demeter Wet Garden, time is as important as place. Our Wet Garden takes place at Easter, full of early spring flowers, including young shoots and buds, after a hard April rain. It is the combinations of those flowers, the rain and the oils from the rich spring soil that comprise this fragrance, one of the most complex in the Library, but one that remains accessible, understandable and eminently wearable." With the first spray, you feel very juicy green grass, like when you were child and you put a grass leaf between your teeth and you feel the scent and also, there is some kind of bitterness in the scent. But here - it's a lot of grass. Soon after, the scent turns into creamy sweet - here, in this moment, the wet flowers emerge. A lot of blooming rain wet flowers, different kinds of flowers, wet grass, wet dirt, wet leaves. Very saturated with these scents, wet air. It is smell of wet, intensely blooming flower garden. You close your eyes and you are literally there. In its "sweet phase", WET GARDEN reminds very much of FLOWERS by KENZO. "Have you ever considered the olfactory side of rain? You know it's coming, you can smell it in the air (exactly!). It does seem that on summer days when it is hot and dry, with a thunderstorm brewing just over the next hill, you can `smell the rain. Well, you can smell something, but rain? Have you ever tried to smell this same rain in January when the ground is frozen solid? Not a chance, but when the ground and plants are warmer, you can smell something. What you really smell comes not from the air, but the ground! Plants release oils that enter the soil and blend with the other earthy odors. These odors are released into the air when the relative humidity at ground level exceeds 75 percent. Moist humid air will transmit odors far better than dry air. 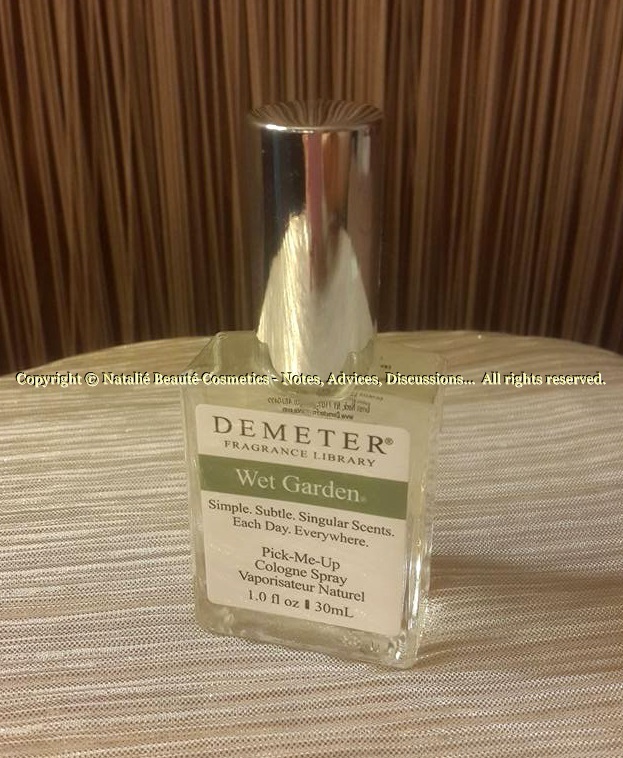 In these moist humid conditions we notice these odors more readily. And since rain is so often connected with moist humid air, we tend to associate one with the other. 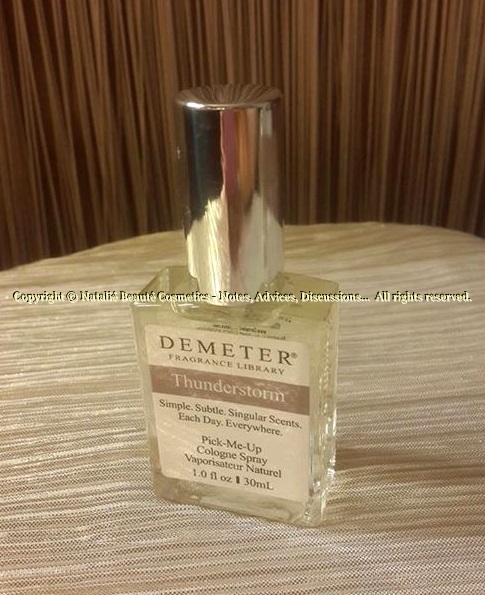 The Demeter Fragrance Thunderstorm captures this complex sensory moment perfectly. Like poetry, Thunderstorm is subtle and difficult to define, but real, with Thunderstorm reflecting the deep and violent nature of a summer storm." Yes, you can "smell the rain" in its intensity of different atmospheric, Nature, urban city and other scents. Air, full of electricity and that specific rain smell. Hot asphalt road, hit by large numerous drops of rain, washing out all the dust and residue, by floods of rain water. Wet grass, very strong dominant smell of wet soil and scent of stormy salty sea waves, crashing on the coast. 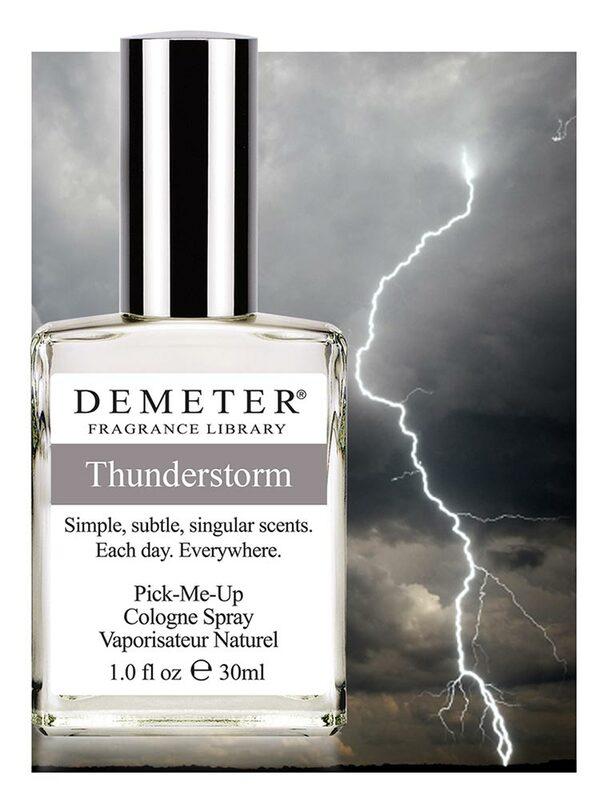 This fragrance really represents storm, captured in a bottle. The product comes in transparent, non-colored, glass bottle, natural spray. Very realistic scents, captured in a bottles. They stay long time on the skin and you're finding yourself often sniffing them, again and again.